Task: To look at the shapes of the gravestones in the cemetery and create a clay sculpture or relief based on findings. Activity: Have a look at the work of Barbara Hepworth: her sculpture, ‘Group of Three Magic Stones’ can be found in Kettle’s Yard. See also the work of Richard Long – his ‘Walking in Landscapes’ are sculptures on a huge scale. Activity: In the cemetery, make sketches of the stones. Draw the shapes and record the details. Look out for crouching angels, twisting ivy, crosses, circles, stone pillows, barley twist, iron fences. Also look out for some of the famous and ornate graves marked on your map, especially those of James Rattee, James Reynolds, and the Lawrence family. Take the long view, stoop or kneel down and sketch a number of gravestones one behind another. 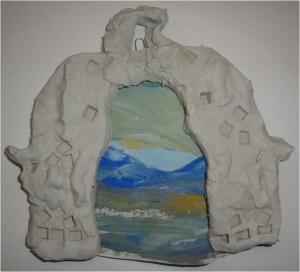 Activity: Use your gathered information to make some clay arches. 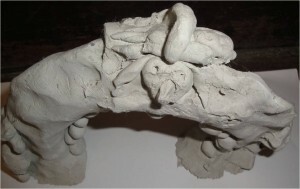 The easiest modelling material is probably new clay, but salt dough can also be used. 1. Roll out a piece of clay into a sausage shape. 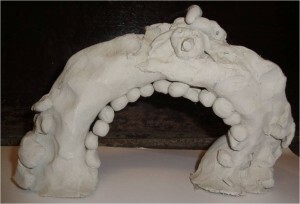 The amount of clay used will determine the size of the arch. Keep some extra clay for details and embellishment. (Don’t roll the clay too thinly or it will break and crumble – unless this is the effect you are trying to create, having looked at the weathering on some of the graves.) Bend the sausage into an arch and make adjustments to the shape. Flatten slightly and embellish. Make sure that you use some water or slip to attached pieces and smooth out any cracks. Make more than one arch and arrange as a group. You could paint a picture from your sketch book and use the arch as a frame. 2. Roll out a piece of clay between two pieces of square doweling. Cut into shape. Use extra clay to decorate. Will it stand up or lie down? Make a few shapes and arrange them as a sculpture.